1 Heat oven to 375°F. Line cookie sheet with foil. Place chicken breasts flat on cutting surface. With knife parallel to cutting surface, cut lengthwise slit in each chicken breast, forming a pocket, keeping other 3 sides intact. 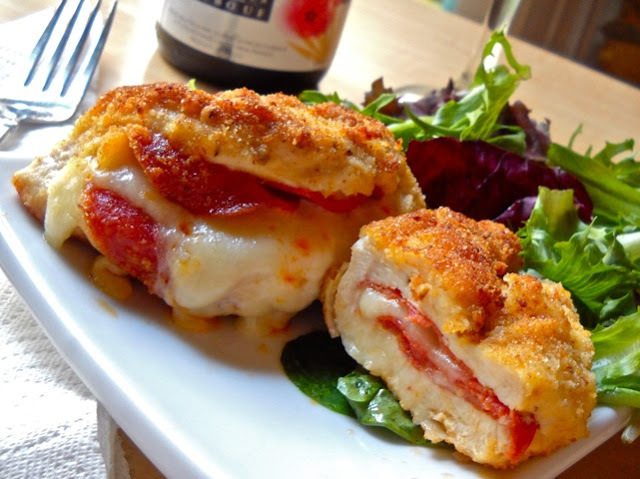 Stuff each chicken breast with pepperoni and mozzarella cheese, pressing edges of each chicken breast to seal. 2 Place chicken breasts on cookie sheet. Spray tops of chicken with cooking spray. Sprinkle bread crumbs evenly over chicken breasts. Spray with cooking spray. 3 Bake 20 to 25 minutes or until juice of chicken is clear when center of thickest part is cut (at least 165°F). Serve chicken with salad greens tossed with dressing.